Sophos Wireless Subscription - Symtrex Inc. Although every organization would benefit from wireless networking, existing solutions either lack important functionality or are too expensive and difficult to manage. Sophos Wireless Security is a new approach that dramatically simplifies the operation of secure and reliable wireless networks. With Sophos UTM ‘s built-in wireless controller, our access points are cost-effective and require no manual configuration, redefining wireless networking for small and medium businesses. Sophos UTM acts as a wireless controller, centrally managing all Sophos access points. The complete configuration, logging and troubleshooting is all performed within the Sophos UTM. Seamlessly integrate wireless access points into Sophos UTM and instantly protect all wireless clients through complete unified threat management security. The access points can be placed anywhere in your organization, providing a strong wireless signal all over the office. 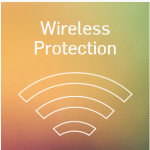 For more information click here for the Wireless Security Datasheet or contact us.